How old is the tooth fairy? 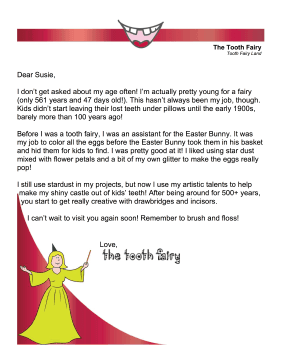 This printable letter addresses the question of age and how long the tooth fairy has been around in American culture. I don't get asked about my age often! I'm actually pretty young for a fairy (only 561 years and 47 days old!). This hasn't always been my job, though. Kids didn't start leaving their lost teeth under pillows until the early 1900s, barely more than 100 years ago! Before I was a tooth fairy, I was an assistant for the Easter Bunny. It was my job to color all the eggs before the Easter Bunny took them in his basket and hid them for kids to find. I was pretty good at it! I liked using star dust mixed with flower petals and a bit of my own glitter to make the eggs really pop! I still use stardust in my projects, but now I use my artistic talents to help make my shiny castle out of kids' teeth! After being around for 500+ years, you start to get really creative with drawbridges and incisors. I can't wait to visit you again soon! Remember to brush and floss!